Feel the "momentum" in May with two very important awareness opportunities. May is National Foster Care Month. We appreciate the important role that foster and resource families play and thank them for their efforts to provide support and stability to children and youth in foster care. May is also an opportunity to raise awareness about the need for families to step forward and accept the challenges of foster care, especially for those children and youth who have special needs. Find great resources for Foster Care Month HERE. Join in local and state activities throughout the month. Foster Care Alumni of America's northern Virginia walk will be May 14 in Springfield. If you're able to travel to Richmond on Tuesday, May 3, learn more about implementation of the new Virginia Fostering Futures policies to improve services to young adults in foster care at the Family Impact Seminar on Aging-out of Foster Care - Fostering Futures into Adulthood. Our friends at NewFound Families (formerly FACES of Virginia Families) are offering scholarships to attend the June 22-25 National Foster Parent Association and National Kinship Alliance for Children Conference in Las Vegas. Contact Cate Hawks for more information, chawks@fovf.org. May also brings us mental health awareness month and specifically on Thursday, May 5, National Children's Mental Health Awareness Day. Locally, NAMI of Northern Virginia and the Fairfax-Falls Church Community Services Board are hosting several Healing Voices film screening events. There is also a National Children's Mental Health Awareness Day event from 6 - 9 PM, May 5 at GWU. Getting Ready for Summer Fun! The warm days of summer are almost here. For many families raising children with special needs, the long break from school can be a great opportunity for family time without the pressures of early mornings and homework. The loss of routine and structure, however, can be challenging. 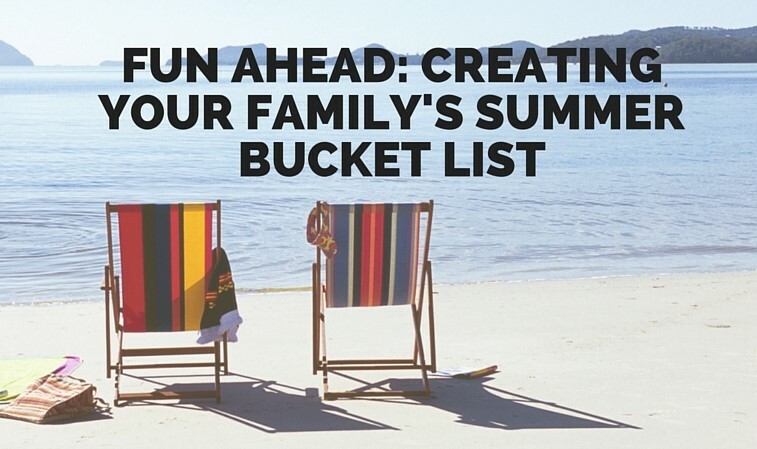 Join kinship and family expert Dr. Kathy Dial on Thursday, May 5 at 7 PM for a free FFF webinar, Fun Ahead: Creating Your Family's Summer Bucket List. Dr. Dial will share suggestions for planning for the summer ahead, keeping kids busy, happy and healthy. Looking for summer camps? We have compiled resources from our partners and friends. Check it out! 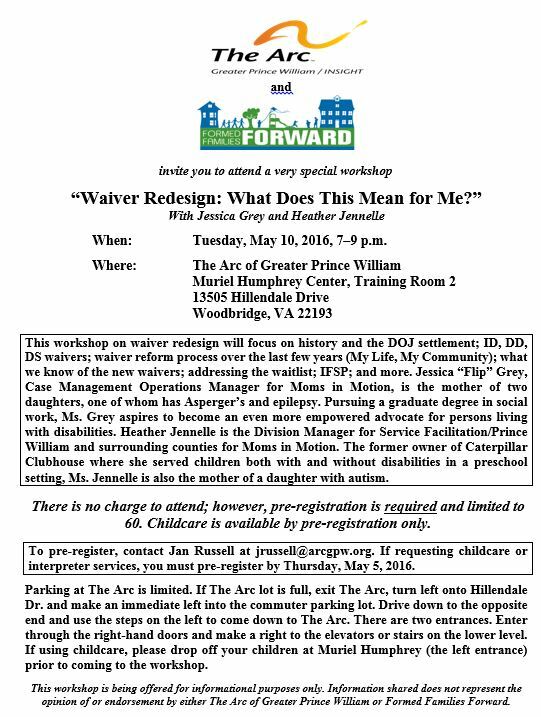 Join Formed Families Forward and The Arc of Greater Prince William on May 10 for an evening of information in Woodbridge. Moms in Motion experts will help us understand the changes to Medicaid long term care waivers for persons with disabilities. Click image below for the flyer. Childcare available and registration is required. Q: I am a social service professional who works with foster families who are already caring for children and youth in care or who are waiting for a placement. Our families see a wide range of issues in their children. Do you have suggestions for materials for that cover a lot of child development topics, but from a foster care perspective? A. Thanks for your question and thanks for all you and your colleagues do to support formed families! April was child abuse prevention month and though the calendar page has turned, the Virginia Coalition for Child Abuse Prevention provides a set of 38 fact sheets that are great resources for formed families all year round. Topics cover children of all ages and needs, from dealing with baby teeth to supporting a child exposed to violence. For kinship families, there is a fact sheet on grandparents raising grandchildren. SCAN of northern Virginia offers information sheets of a wide range of parenting topics, including four specific to special needs parenting. For families caring for children and youth with disabilities and other specific developmental, learning or mental health challenges, ChildMind provides the Parents Guide to Getting Good Care. The Guide helps parents navigate systems and providers and advocate for the best treatment for children in their care. May 10-11 - 2016 Special Education Advocacy Symposium, hosted by PEATC, Staunton. Apply now! May 14- Foster Walk Northern Virginia. Join Project LIFE for this great event that builds awareness of child abuse, its lifelong effects, and inspiration for healing. Springfield. June 3- NAMI Northern Virginia's 2nd annual SummerFest! for Teens, Young Adults and Families Contact NAMI to learn more. Heather Forbes and Beyond Consequences LIVE coming Saturday! 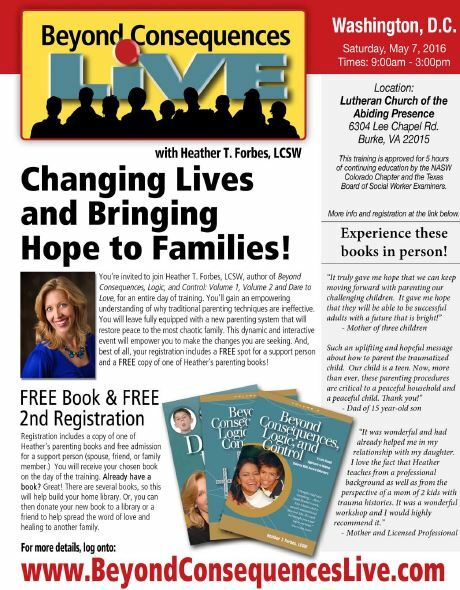 National adoption and attachment expert Heather Forbes is coming to northern Virginia - Saturday, ,May 7 in Burke. More HERE. Look, look, what's on Facebook!?! We post news and events every day just for formed families and professionals who care about adoption, foster care and kinship care. Get the latest updates on what is happening around the region on our FFF Facebook page. LIKE us! Our Stronger Together peer support groups for youth and young adults age 14- 22 and for parents and caregivers will continue through May, meeting twice a month. Enrollment for our groups is open, so learn more HERE.